a docker-compose file that orchestrates and runs those containers. If you don't know docker-compose, it's a tool to define and run applications using multiple containers. This is very handy in our case, as we need to start a few services, and therefore a few containers, to have our whole stack running. On the first run, docker-compose will build the various images (this should take only a few minutes) and then will start them. 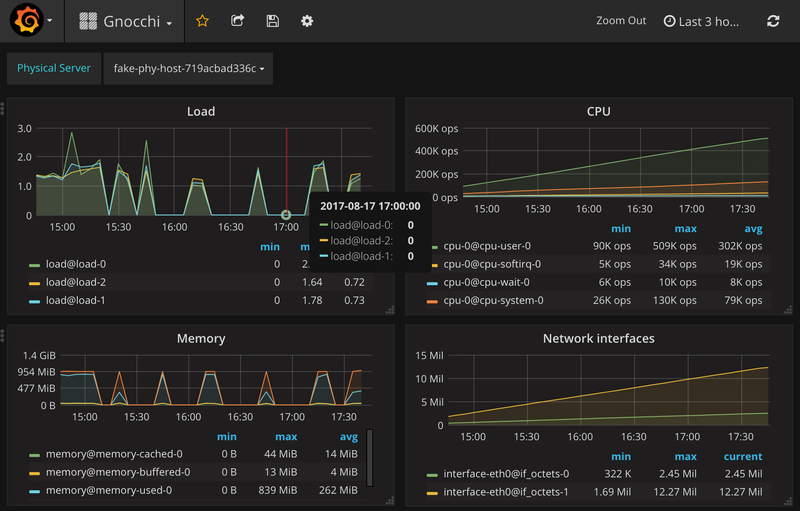 Once everything is started, you can connect to Grafana by typing the URL http://<ip of your docker server>:3000 in your browser and using "admin" as username and "password" as password. Just click on the dashboard entitled "Gnocchi" and wait a few minutes: you will see the chart being drawn in real time! The data fed into Gnocchi come from the collectd container, which gathers various metrics (CPU, network interface statistics, etc). You can then edit the docker files as you like to add new features or test your code. The files are also a good basis if you want to deploy Gnocchi in production running Docker! You can now have fun creating new resources and metrics! Feel free to contribute patches to the GitHub project too, obviously!